If tidying up after the action sounds like a better idea, Viscera Cleanup Detail is the game for you. This 2015 game was made by South Africa–based RuneStorm, a three-man team that previously won several prizes in 2008’s Make Something Unreal mod competition before moving into making their own games. In it, you play as a janitor employed by a shady corporation and tasked with cleaning up after disasters—an alien attack, a mutant carnivorous plant outbreak, or renegade robots, to name a few. One of the more tame messes you’ll be cleaning up. Don’t expect a gripping story here. Each level begins with a text briefing of what’s happened and a thinly veiled warning to clean up all the evidence, or else. There are data pads throughout the levls with snippets of background details, usually instructions for security teams to eliminate the threat, or employees complaining about unsafe working conditions. 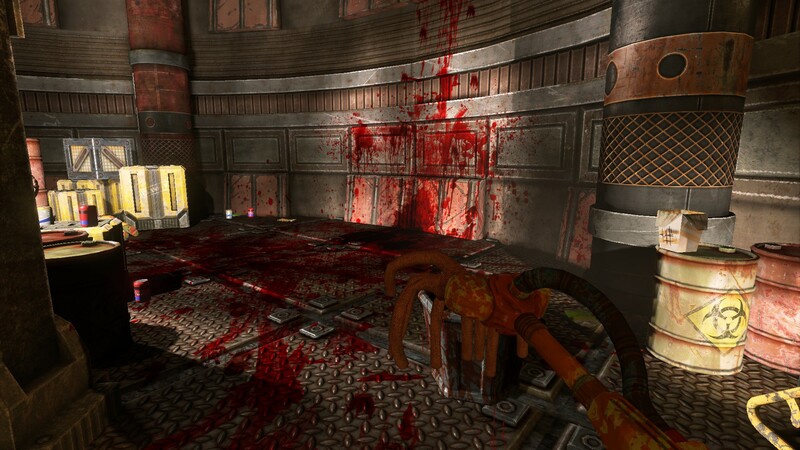 And Viscera Cleanup Detail takes janitorial work seriously. While mopping up blood may sound easy, the water in your bucket gets dirty after cleaning off your mop enough times. Mop with dirty water and you’ll end up spreading the mess; accidentally knock over a bucket of dirty water and you’ll create a whole new job for you to tackle. Similarly, a lesson you’ll quickly learn is that walking through blood will cause you to trail bloody footprints across the floor, forcing you to strategically mop your way to your destinations. Levels with multiple floors will force you to think on how to efficiently move your buckets and trash without any disasters—on more than one occasion I spilled a dirty water bucket in an overloaded elevator, forcing me to ride the lift up and down, mopping the bloodstain on the wall of the elevator shaft in the few moments I passed by. One unique feature of the game is that you can hook up two Xbox controllers to your PC via USB and play splitscreen on a single monitor. Traditional online multiplayer exists as well, but it can often be difficult to find other players due to the relatively small player base. There are 18 levels of a range of sizes to clean your way through, with small maps taking about 45 minutes to clean and the largest taking up to three hours. Each is centered around three stations: the waste-bin dispenser, the water bucket dispenser, and the incinerator. The incinerator is the heart of your efforts, effectively destroying anything you throw in it, be it limbs, guts, trash, or evidence of your employer’s wrongdoing. To earn a satisfactory rating you need to clean up all the blood, burn all body parts and trash, and patch any bullet holes. Thankfully you’re given a “sniffer,” a handheld device that helps point you toward anything you may have missed. To get the employee-of-the-month award you can go beyond and complete level-specific objectives like reinstalling security turrets or placing new eggs (of the species whose hatchlings have just killed everyone) into incubators. If you really want tedium, for extra points you can retrieve deceased staff’s ID cards and fill out paperwork on how they died, or stack boxes and barrels into the designated loading areas. And really, tedium is the name of the game here—this is a janitor simulator, after all, and it takes a certain mindset to enjoy it. Someone who finds doing the same thing repeatedly will get bored easily, but there is great satisfaction in starting with a filthy environment and cleaning it up until it’s spotless. Viscera Cleanup Detail is an easygoing game, great to play with listening to music or to a podcast, and well worth the $13. Residing in Centerville, Clint enjoys writing in his spare time. He likes Judge Dredd, Warhammer 40K, bourbon, and ’90s grunge.